Publisher Dark Horse Books has announced Mogworld, the debut novel of The Escapist's Ben "Yahtzee" Croshaw. If you're impressed by the amount of humor that Zero Punctuation's Ben "Yahtzee" Croshaw can cram into a five-minute video, then brace yourself: Croshaw is currently writing a full-length novel to be published by Dark Horse Books. Set for release in August of 2010, Mogworld tells the story of Jim, a minor MMORPG character who dies in a magic-school accident, only to be reanimated 60 years later by a renegade necromancer. Dark Horse Books made this announcement in conjunction with Croshaw's first stateside appearance at Philadelphia's GameX this weekend, where he'll be presenting never-before-seen Zero Punctuation footage, signing autographs and mingling with fans. If you're within driving distance, you owe it to yourself to check it out. OCTOBER 23, MILWAUKIE, OR -- Coming soon from Dark Horse Books: Critical sensation Ben "Yahtzee" Croshaw (The Escapist's Zero Punctuation Reviews) brings his signature acerbic wit to his debut novel, Mogworld. 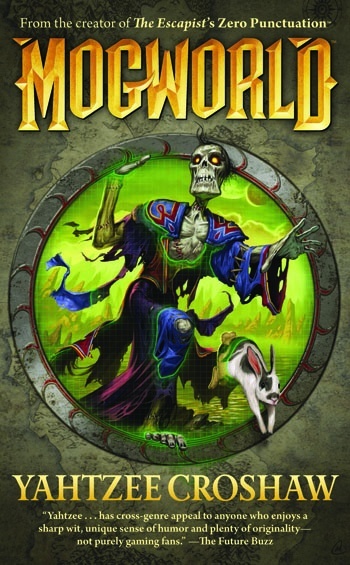 Mogworld, a comedic fantasy novel with a twist, is the story of Jim, who, sixty years after dying in a magic-school mishap, is wrenched back to life by a renegade necromancer. All Jim wants is to die properly, once and for all - no easy task for a minor character in a MMORPG (Massively Multiplayer Online Role-Playing Game). Croshaw's animated Zero Punctuation reviews, which package prescient criticism with frenetic animation, off-color humor, and rapid-fire delivery, have made him a household name in the gaming community. Although Croshaw has covered a lot of creative and critical ground in his short career-before Zero Punctuation, he gained a reputation as an independent game designer and blogger, and he recently produced the pilot for a TV series, Game Damage - Mogworld is his first foray into published fiction. "I love Zero Punctuation, and I had asked Yahtzee to pitch us a book about video games," explains Mogworld editor Rachel Edidin. "The last thing I expected was a novel draft! And the next thing I knew, I was taking the manuscript home with me-less to finish it than because I had to see what happened next." Says Croshaw, "I've been trying to write novels ever since I first read Hitchhiker's Guide at the age of eight, so this is a pretty big deal for me, and I'm very happy to be working with Dark Horse on this. Mogworld is an idea I've been kicking around ever since those dark, unproductive three months I spent playing World of Warcraft. It's a bit of a cynical take on MMOs and the standard Tolkienesque 'fantasy' setting." Mogworld is announced in conjunction with Croshaw's first stateside appearance at this weekend's GameX show in Philadelphia. Mogworld is set to arrive on shelves in August 2010. Sounds like we might be seeing something like a cross between Pratchett and LFGComic. Not that that's a bad thing by any means, he'll almost certainly be making a sale out of me assuming it gets published in the UK. OH now this is very exciting i'm gonna be looking for this at me local book selling place. Oh, man. This looks quite promising and I hope my bookstores won't be full of fail. Do you know if it'll be published in the UK? If so i'm buying it. Well... I now have another book to look out for. may be interesting if I don't die before it's published. That's all the motivation I need. Definitely getting that. Be very interesting to see how he writes. Well,that rocks. I just may import that. Actually, it looks pretty awesome. I'll be keeping an eye on it. the cover arts theme and characters looks suspiciously familiar, but im sure it will be completely different and possibly good, heres hoping it will be released in Europe within shipping distance. ...Damn now Im gonna hold out just for this. I dunno about this... I'm just not sure if his writing style would work well for a novel rather than an editorial. We'll see, I guess. Agreed, and I love both Pratchett and Looking For Group. Personally, I'm intirgued. Although I'm quite a sci-fi reader, I do take a while to get drawn in to new series. I generally read the first book hesitantly, then if I like it I'll reread and then look at the rest of the series, or if it's a stand alone thing I'll reread if I enjoy it. Same with graphic novels (which I've only recently got into thanks to Alan Moore). So I'll probably take a hesitant look, but if it's any good then I'll definitely be getting it. Well done to Ben either way for managing this though, I can honestly say that while I'm by no means a fanboy, I am definitely jealous and wish I had Ben Croshaw's life. But yeah, well done to him and I hope it's a success :D.
Uhm. How could it ever be a bad thing? Pratchett is probably the best comedy writer I know.and LFG is one of the funniest web comics I know. This is like pizza and lasagna combined to make some kind of a miracle pie. I dunno, when I typed it out I thought someone might take it as me saying "Oh, it's just a cross between these two series. How original." and being all sarcastic and whatnot, so I felt it needed a qualifier so there were no misunderstandings. British release date? oh and good on Yahtzee!!! Yeah, but this is the thing - one thing to combine two things, and the other to do it well. The link's okay. I promise. Sounds interesting, I'll have to check this out. Yahtzee sure gets around doesn't he. Wonder how he finds the time to do all that stuff, btwn playing games, reviewing games, making videos, writing articles, and now writing novels; man, I'm getting worn out just thinking about it. I might just buy this, it sounds fun. I always wondered why he couldn't get it published - it's amazing and he has a huge fanbase. Oh, I'm so saving my money for this. I shall get this book!!!!! Already bought, essentially. I just need to give the store my money, now. Buying it.Nao. Screw waiting till '10! I'm not so sure about this. Remember the "has halo crossed the line?" threads some people made when the halo anime was announced? Because I think I'm getting the feeling they had from this.